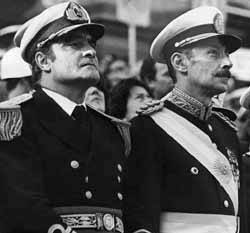 Admiral Emilio Massera and Junta chief General Rafael Videla. and disappearances carried out by military intelligence Battalion 601. Kissinger to Argentine Generals in 1976: "If there are things that have to be done, you should do them quickly"
Relatives continue to search for the tens of thousands of disappeared in Argentina. Washington, D.C., March 23, 2006 - On the eve of the 30th anniversary of the military coup in Argentina, the National Security Archive posted a series of declassified U.S. documents and, for the first time, secret documents from Southern Cone intelligence agencies recording detailed evidence of massive atrocities committed by the military junta in Argentina. The documents include a formerly secret transcript of Henry Kissinger's staff meeting during which he ordered immediate U.S. support for the new military regime, and Defense and State Department reports on the ensuing repression. The Archive has also obtained internal memoranda and cables from the infamous Argentina intelligence unit, Battalion 601, as well as the Chilean secret police agency, known as DINA, which was secretly collaborating with the military in Buenos Aires. The documents record Washington's initial reaction to the military takeover. "I do want to encourage them. I don't want to give the sense that they're harassed by the United States," Secretary of State Kissinger ordered his staff after his assistants warned him that the junta would initiate a bloodbath following the coup. According to the transcript, Kissinger's top deputy on Latin America, William Rogers, told him two days after the coup that "we've got to expect a fair amount of repression, probably a good deal of blood, in Argentina before too long." State Department cables, including some obtained previously by the Argentine newspaper, Clarin, show that U.S. officials had prior knowledge of coup plotting. More than a week before the coup, Ambassador Robert Hill sent Assistant Secretary Rogers a secret cable reporting that the commander of the Navy, Admiral Emilio Massera, had requested that the U.S. embassy "indicate to him one or two reputable public relations firms in the U.S. which might handle the problem for a future military government." Massera, according to the cable, promised that the Argentine military would "not follow the lines of the Pinochet takeover in Chile," and would "try to proceed within the law and with full respect for human rights." But although the military repression in Argentina drew less international attention than the Pinochet regime's in Chile, it far exceeded it in terms of human rights violations. By mid 1978, according to a secret cable from the DINA station in Buenos Aires, posted here publicly for the first time, the secret police battalion 601 had "counted 22,000 between dead and disappeared, from 1975 to the present date [July 1978]." Thousands of additional victims were killed between 1978 and 1983 when the military was forced from power. Some of the victims were Uruguayans living in Buenos Aires at the time of the coup. A secret Argentine intelligence report records an operation to kidnap two Uruguayan citizens who were then disappeared. "From: State Intelligence Secretariat. To: Intelligence Battalion 601... Primary objective: Jorge Zaffaroni [and] Maria Zaffaroni, Results: Positive…" reads the military form dated September 29, 1976. Other records posted today provide details on efforts to wipe out a Uruguayan resistance group known as OPR-33 through Operation Condor, a network of Southern Cone secret police services that worked together to eliminate opponents of their regimes. "For the sake of history, memory and justice, it is extremely important that this kind of information from the Argentine intelligence and security services be made public and rigorously analyzed," said Professor Marcos Novaro, who directs the political history project at the University of Buenos Aires. "It is clear from Secretary of State Henry Kissinger's reaction that Argentina had to pay in blood for the sake of stability in the region," said Archive analyst Carlos Osorio. "The U.S. knowingly supported a national security doctrine that disregarded all civilized norms and any adherence to human rights, and tens of thousands of Argentines paid the ultimate price." In the year preceding the coup, Argentina descended into a spiral of violence. On one side, death squad operations carried out by the Anti-communist Argentine Alliance (AAA), sponsored by the government, the Federal Police and the Armed Forces, claimed hundreds of victims per month; on the other side the People's Revolutionary Army (ERP) and the Montoneros guerrillas attacked a number of economic installations. Scores of union leaders, popular activists, journalists, scientists, lawyers and intellectuals as well as public servants, military men and business people were targeted. Private companies, many of them U.S. corporations, saw their executives threatened and killed. The U.S. Embassy received numerous threats and attacks; one of its staffers was wounded and another killed in 1975. Political chaos was compounded by economic upheaval. By early 1976, Isabel Peron, who had succeeded her late husband as president, was weak and isolated. The military coup was seen by many in the Argentine polity as an inevitable step to bring stability. Washington welcomed the military takeover. Initially, reports by the U.S. Embassy branded it as "moderate in character" and the "most civilized coup in Argentine history." The administration of President Gerald Ford was ready to support the new Junta financially and with security assistance. But, as the U.S. Ambassador put it: "the USG [U.S. government] of course should not become overly identified with the Junta, but so long as the new govt can hew to a moderate line the USG should encourage it by examining sympathetically any requests for assistance." At the very first State Department staff meeting after the coup, Assistant Secretary William Rogers predicted to Secretary Kissinger that the Argentine military was "going to have to come down very hard not only on the terrorists but on the dissidents of trade unions and their parties," and recommended that "we ought not at this moment rush out and embrace this new regime." Kissinger, however, ordered U.S. support for the new government. "Whatever chance they have," Kissinger noted, "they will need a little encouragement from us." As predicted by the State Department, the military Junta instituted widespread and vicious repression following the coup. Not only Argentines were targeted, but also citizens from Chile, Paraguay, Bolivia and Uruguay who had taken up political exile in Argentina to escape repression in their home nations. As part of Operation Condor-a network of Southern Cone secret police services collaborating to eliminate opponents of their regimes--the Argentine military carried out numerous operations against foreigners trapped in Buenos Aires after the coup. An Argentine intelligence report obtained by the Archive through a confidential source records information provided by the Uruguayans authorizing the State Intelligence Secretariat to order Intelligence Battalion 601 to kidnap the Zaffaroni couple; the operation is successfully carried out, and the couple is handed to the Uruguayan authorities and never heard from again. An October 1, 1976, U.S. Defense Intelligence Agency cable reports that in a one week operation the intelligence cooperation of Argentina and Uruguay has destroyed the OPR-33. By mid 1978, military repression in Argentina had already peaked and was winding down, but human rights violations nevertheless continued. The Carter administration's policy of open diplomacy on human rights brought significant international pressure on the Junta to begin to curtail its abuses. But torture, disappearances, and executions continued at a reduced level until the military was defeated during the Falklands war, and forced to withdraw from power. How many people were killed and disappeared during the seven years of dictatorship? "It is our estimate that at least several thousand were killed and we doubt that it will ever be possible to construct a more specific figure," says the U.S. Ambassador in one cable in early 1978. The National Commission on the Disappeared (CONADEP) was able to document 9,089 persons disappeared at the hands of the regime. Another U.S. declassified State Department memo, titled "Disappearance Numbers," places that figure at 15,000 by late 1978. But one internal DINA document, obtained by journalist John Dinges for his book, The Condor Years, recorded secret numbers on the dead and disappeared compiled by Argentine Intelligence Battalion 601 between 1975 and July 1978. The cable, sent by DINA's attaché to Buenos Aires, Enrique Arancibia Clavel (using the code name Luis Felipe Alemparte Diaz) stated that that he was "sending a list of all the dead" which included the official and unofficial death toll. Between 1975 and mid 1978, Arancibia reported, "they count 22,000 between the dead and the disappeared." The DINA cable, according to Dinges, "provides important corroborating evidence that the true number of disappeared is significantly higher than the 9,089 persons listed by CONADEP in the 1980s." This section was drafted in collaboration with Fernando Rocchi and Catalina Smulovitz of Universidad Torcuato Di Tella. Source: Collection compiled by National Security Archive analyst William Burr. Selected by Archive Senior Analyst Peter Kornbluh. Two days after the military coup, Secretary of State Kissinger convened his weekly staff meeting. In this declassified secret transcript of the first conversation on Argentina, Assistant Secretary for Latin America, William Rogers informs Kissinger that for the Argentine generals' government to succeed, they will make "a considerable effort to involve the United States - particularly in the financial field.". Kissinger responds "Yes, but that is in our interest." Rogers advises that "we ought not at this moment rush out and embrace this new regime" because he expects significant repression to follow the coup. "I think also we've got to expect a fair amount of repression, probably a good deal of blood, in Argentina before too long. I think they're going to have to come down very hard not only on the terrorists but on the dissidents of trade unions and their parties." But Kissinger makes his preferences clear: "Whatever chance they have, they will need a little encouragement… because I do want to encourage them. I don't want to give the sense that they're harassed by the United States." Source: U.S. Department of State Argentina Declassification Project, 2002. Originally released through FOIA request by and published in Suplemento Zona, Diario Clarín in 1998. More than two months before the coup, U.S. intelligence agencies and the Department of State learn that the Argentine military is planning to take power. In this secret cable U.S. Ambassador to Argentina Robert Hill reports directly to Secretary of State Kissinger and his Assistant Secretary for Latin America, William Rogers, that officials at the Ministry of Foreign Affairs and journalists in contact with the Argentine Army Chief of Staff Roberto Eduardo Viola, have been told that the military are drafting a public relations plan to accompany the upcoming coup. The public relations plan is intended to cast the new military government in a positive light, in order to avoid human rights sanctions from the U.S. Congress. But the Argentine military passes word to the U.S. Embassy that "some executions would…probably be necessary" and "they wish to minimize any resulting problems with the US." In his conclusion Ambassador Robert Hill observes: "it is encouraging to note that the Argentine military are aware of the problem and are already focusing on ways to avoid letting human rights issues become an irritant in US-Argentine relations." Source: U.S. Department of State Argentina Declassification Project, 2002. Originally released through FOIA request to and published in Suplemento Zona, Diario Clarín in 1998. "will not follow the lines of the Pinochet takeover in Chile… will try to proceed within the law and with full respect for human rights…had no intention of resorting to vigilante-type activities, taking extra-legal reprisals or of taking action against uninvolved civilians." Massera asks whether the Ambassador can recommend a public relations company to manage the military government's public image. Hill responded "I emphasized that the US government could not in any way become involved in the Argentine internal affairs." Hill then offers Admiral Massera a list of reputable public relations firms that the Embassy keeps. "This was probably the best executed and most civilized coup in Argentine history. It was unique in other ways too. The US has not been accused of being behind it, except by Nuestra Palabra, the organ of the PCA. The Embassy hopes to keep it that way." "The U.S. government of course should not become overly identified with the Junta, but so long as the new government can hew to a moderate line the U.S. government should encourage it by examining sympathetically any requests for assistance." Source: Documentation Center and Archive for Human Rights of the Paraguay Supreme Court, aka. "Archive of Terror." Collected by Carlos Osorio. The Uruguayan Army Intelligence Department II sent this list of OPR-33 most wanted members to intelligence services of the Southern Cone. Among those listed are Jorge Roberto Zaffaroni Castilla (Page 4, second from the bottom), and Maria Emilia Islas Gatti de Zaffaroni (Page 5, 4th from the bottom). The document was obtained from the Archive and Documentation Center for Human Rights (CDyA) of the Paraguayan Supreme Court, or "Archive of Terror" of the Paraguayan Secret Police where several unique documents have been found pertaining to the Southern Cone cooperation of intelligence services known as Operation Condor. Of the people listed in this document, many were kidnapped and tortured and twelve were disappeared at the hands of Argentine and Uruguayan security forces who coordinated their repression in the mid 1970's. Four children that were captured with their parents, or were born in captivity, were stolen and raised by their kidnappers--intelligence officers. Source: Declassified by DIA in response to request by Italian Judge GianCarlo Cappaldo. Copy obtained by John Dinges. This Defense Intelligence Agency Intelligence Report (IR) records the Operation Condor collaboration between secret police officials in Argentina, Uruguay and Brazil. 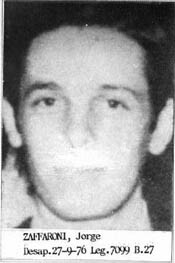 DIA sources report that "On September 15 1976… Roberto Viola, Chief of the Army Staff, Brigadier General Suarez Mason, I Corps Commander and Colonel Juan Saa, Assistant Army G-2… [were] en route to Montevideo… A senior Army Colonel responsible for internal Argentine intelligence… was leaving on September 17, 1976 for Brasilia to discuss intelligence matters with the Brazilian armed forces… [an unidentified source states] the mission was secret and that the Argentine Army was exchanging information on subversion… but did not elaborate to what extent coordination took place beyond exchange of intelligence information. The visit of the Army officer to Brazil provides firm information that the Argentines are actively coordinating with their neighbors on counterinsurgency matters. While the purpose of BG Viola's trip to Uruguay is not clear, it could very well have been to coordinate counter subversion activities…"
This military form records, in bureaucratic language, the repression of Battalion 601. It states that Uruguayan citizens Jorge Zaffaroni and Maria Emilia Islas de Zaffaroni have been captured in Buenos Aires and handed to the Uruguayan government's Anti-Subversive Operations Coordinating Organization (OCOAS - Organismo Coordinador de Operaciones Anti-Subversivas). "From: State Intelligence Secretariat.. To: Intelligence Battalion 601... Primary objective: Jorge Zaffaroni [and] Maria Zaffaroni, Results: Positive…"
The Zaffaroni couple disappeared on September 29 in Buenos Aires. The record shows that information coming from abroad ("Exterior" most likely means from Uruguayan intelligence) prompts the Argentine State Intelligence Secretariat (SIDE - Secretaria de Inteligencia del Estado) to order, on September 18, the capture of the Zaffaroni couple. Battalion 601 then records that the operation was successfully completed on September 27 or 29. The document was obtained by the National Security Archive through a confidential source. Source: Chile Declassification Project, Department of Defense, 1999. First published in The Pinochet File, by Archive analyst Peter Kornbluh. This Defense Intelligence Agency (DIA) Intelligence Report (IR) provides information on joint counterinsurgency operation by Southern Cone countries in what was known as Operation Condor. "Operation Condor is the code name given for intelligence collection on leftists, communists and Marxists in the Southern Cone Area. It was recently established between cooperating intelligence services in South America in order to eliminate Marxist terrorist activities in member countries with Chile reportedly being the center of operations. Other participating members include: Argentina, Paraguay, Uruguay and Bolivia… Members showing the most enthusiasm to date have been Argentina, Uruguay and Chile." In particular, the document accounts for the recent joint Argentine and Uruguayan raid in Buenos Aires during which the Zaffaroni couple was kidnapped and disappeared. The document refers to a high-ranking Argentine military delegation to Montevideo reported a few days earlier in the DIA cable above, as a sign of the preparation for these operations. "During the period 24-27 September 1976, members of the Argentine State Secretariat for Information (SIDE), operating with officers of the Uruguayan Military Intelligence Service carried out operations against the Uruguayan terrorist organization, the OPR-33 in Buenos Aires. As a result of this joint operation, SIDE officials claimed that the entire OPR-33 infrastructure in Argentina has been eliminated…"
… It is our estimate that at least several thousand were killed and we doubt that it will ever be possible to construct a more specific figure." Taking into account the small positive steps the military Junta has taken so far, Ambassador Castro concludes: "The USG should concentrate its efforts on the opportunities created for continued progress toward return to the rule of law. While not condoning or pardoning the GOA for its part in the disappearances, we should avoid endorsing demands for an accounting." Source: U.S. Department of State Argentina Declassification Project, 2002. Copy collected by Carlos Osorio in 2006. Reporting on several human rights issues to his colleagues at the Department of State, U.S. Embassy Human Rights officer, Tex Harris writes that in addition to the PEN prisoners, "One of the jargon breakthroughs we have made recently concerns the DAMs - Personas bajo disposicion autoridad militar. This is the argot for the disappeared but alive non recognized prisoners…." Harris identifies a new prison and suggests that intelligence reports estimate that it could hold up to 1000 "non recognized" prisoners. The problem, he writes, "is that very few people are released from the detention centers which are "outside the law." The Embassy sends a cable to the Department of State explaining how important it is to support the Red Cross work in Argentine. The cable reports that according to a secret source, the U.S. embassy has learned that "the Red Cross has begun to have access to political prisoners being held at the Disposition of Military Authority ("DAM") … The ICRC's [International Committee of the Red Cross] central tracing agency's work here is important in the effort to establish an accurate number of quote disappeared unquote in Argentina. REFTEL B reports that the current ICRC files contain more than 20,000 cards of detained and missing persons in Argentina…"
Source: Copy obtained by John Dinges at Argentina's Federal Courts. Cited in 2005 in John Dinges' book The Condor Years and published here for the first time. The document excerpted here contains the only known report of the calculation by Argentine military intelligence itself of the number of people their operatives had killed in the repression. The document was sent to Chile's DINA headquarters by Chilean intelligence official Enrique Arancibia Clavel, who used the pseudonym "Luis Felipe Alemparte Diaz," and is based on records he was allowed to examine in the headquarters of Army Intelligence Battalion 601. 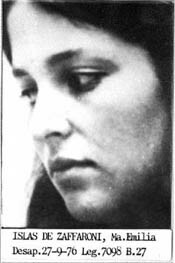 Arancibia Clavel was Chile's representative in Argentina of the "Operation Condor" network created in November 1975 by the security forces of Chile, Argentina, Uruguay, Brazil, Bolivia and Paraguay. Weeks before writing this report, he had been requested by his superiors in Chile to send names and numbers of killed and disappeared in Argentina. The report provides important corroborating evidence that the true number of disappeared is significantly higher than the 9,089 persons listed by the National Commission on the Disappeared (CONADEP) report in the 1980s. It is also significant that the military intelligence count starts in 1975, at a time the military took over national repressive activities from the national police but several months before the military coup in March. Since the disappearances are known to have continued several more years, the actual total of those disappeared by the military should be extrapolated beyond the 22,000 who had already been killed at the time the report was written in July 1978. The document is among approximately 1500 pages of documents confiscated from Arancibia's office and home by the Federal Court of Argentina in November 1978 and held in court archives. John Dinges obtained a copy of the Federal Court's five volume compilation of Arancibia's documents in January 2002 and provided them to the National Security Archive. The document displayed here is Volume V, p. 238. The document was first published in John Dinges, The Condor Years: How Pinochet and His Allies Brought Terrorism to Three Continents (The New Press). "[T]hese lists include 'official' as well as 'non official' deaths. We got this from the Army Intelligence Battalion 601, located on Callao and Viamonte streets, which is under the Army Chief II of Intelligence at the Army general Command of the Chiefs of Staff of the Army. Those listed as NN are those unidentifiable corpses, almost 100% correspond to extremist individuals eliminated by "left hand," by the security forces. The tally of those killed and disappeared from 1975 up to date is 22,000. Luis Felipe Alemparte Diaz"
Responding to requests by the Department of State to clarify the latest U.S. Embassy's Human Rights Round Up, the Embassy reports that "Information regarding the elimination of terrorists and subversives is understandably an area of great sensitivity within the GOA [Government of Argentina] and is very closely held. Consequently, the Embassy has no current information regarding the magnitudes of eliminations of terrorists and subversives…"
The U.S. Embassy officer in charge of human rights, F. Allen "Tex" Harris, writes a report on the number of disappeared in Argentina. 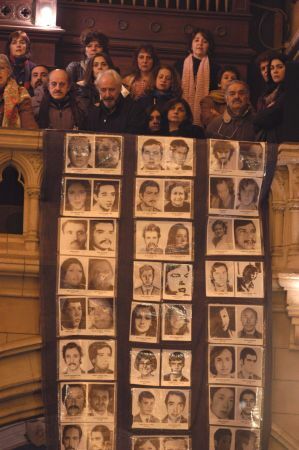 The Argentine Ministry of the Interior statistics passed to the Embassy show the numbers of disappeared declining from 2500 in 1976 to 800 in 1978. The overall numbers of disappeared tallied by the Ministry is 4,780 for the period. In several other reports, Harris estimates that the official figures, including the 9000 names of disappeared compiled by the human rights office at the Embassy, are but a fraction of the actual total of disappeared people. In this memo, Harris opens his report stating "Disappearance numbers… a senior army official had informed the [Catholic] Nuncio that the armed services had been forced to 'take care of' 15,000 persons in its anti-subversion campaign." * The documents marked with an asterisk were published jointly in 2001 by the National Security Archive and the Centro de Estudios Legales y Sociales CELS.